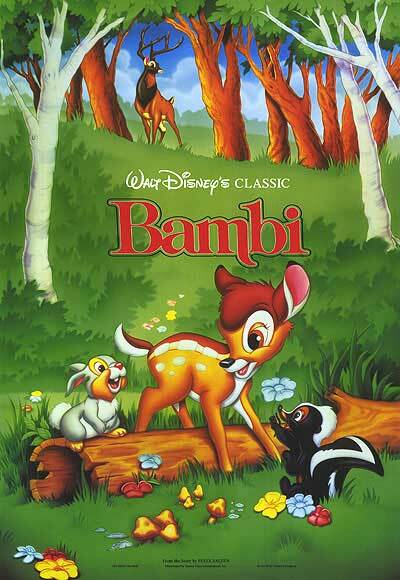 We begin the film with Bambi's birth and his adventures as a fawn. We see him learn to walk, make friends with Thumper and Flower, and thoroughly enjoy discovering the world. It's an idyllic childhood that touches on much we as human's experience as children, allowing us to relate to this lovable deer. But as with all of us, childhood must end, and Bambi unfortunately loses his at the hands of hunters when they kill his mother. There's no more frolicking, just a sad winter alone. Bambi emerges in spring as a young buck, his body maturing to catch up with the maturity already forced upon him by the loss of his mother. 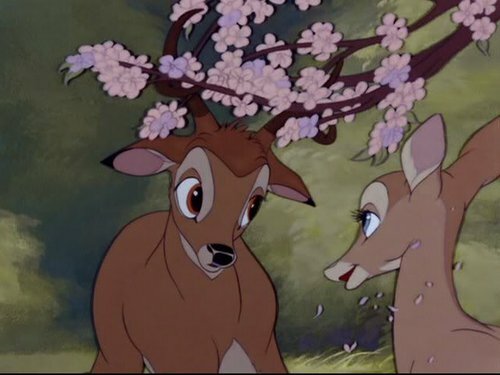 Once again, Bambi's experience reflects that of a human's, this time in the stage of a teenager. Most obviously, we see his interest in and pursuit of a girl, as he and his friends become "twitterpated." 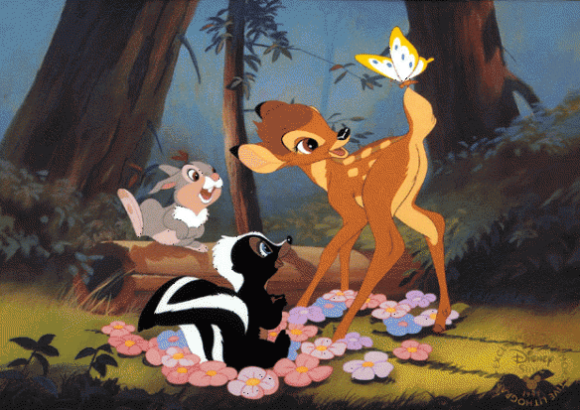 And Bambi not only likes Faline, but even fights for her, fending off another would-be pursuer. Most importantly however, is not his maturity in romance, but his shouldering of responsibility and care for those he loves as man brings fire to his forest home. He must save Faline from hunting dogs and push through his own pain after being shot to run to safety. Now there is no uncertainty, even his childhood home is taken away from him and he must accept that life is forcing him to grow up. We end the film where we began. 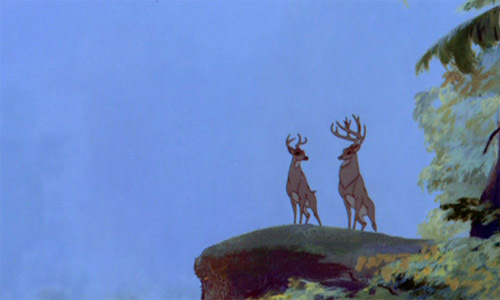 Bambi has now reached adulthood and is rewarded with a family of his own, the last scene showing Bambi standing with his father in their place of royalty. While at times mysterious, his father has guided Bambi at each stage, present after the time of his mother's death, as well as pushing Bambi along through the fire. He has ensured Bambi would survive, and at the end we see him walking down the hill, leaving Bambi alone to survey the forest. Whether or not this is a symbol of the passing of the crown to Bambi as king of the forest, it is clear that his father is acknowledging his adulthood, leaving him to care for his own family.